This knee wrap has an open popliteal design to prevent bunching and irritation at the back of the knee. It is ideal for the geriatric population and patients with excess swelling and/or soft tissue around the knee. The rubber donut around the kneecap provides increased patellar stability, improved patellar tracking, and increased awareness of posture, movement and position change. Easy to apply or remove with simple wrap design. Ideal for swollen or injured knees. A removable rubber donut adds patella stability and improves patella tracking. Neoprene gives compression and therapeutic warmth. Fits range of sizes. Color: Navy. heat, which provides increased warmth to the knee, thereby increasing circulation and decreasing pain. The thickness of neoprene also helps restrict excess motion and provides added support. This stabilizer comes with a removable horseshoe that can be adjusted superiorly, inferiorly, medially or laterally depending on the stability needs of the knee. The horseshoe provides increased pressure around the patella for patellar tracking problems. Medial/lateral stability is provided by the spiral stays. bones on the each side of the knee. Secure the hook and loop thigh closure, then calf closure. Secure thigh and calf straps. Unique Breathable Foam Material is latex free and neoprene free. Provides compression with a soft plush fabric against the skin. Non-irritating for those with sensitive skin. Wrap-Around Design is ideal for swollen or injured knees – quick and easy to apply. Flexible Spiral Stays provide medial and lateral (side-to-side) stability of the knee joint. Open Popliteal eliminates bunching and irritation behind the knee. 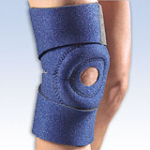 Condyle Pads offer additional padding and stabilization to the patella. Adjustable Support Straps for an improved fit that stays in place. Latex free and Neoprene free. This knee support is made with soft, breathable foam material that is both neoprene and latex free. This unique material provides compression to the knee with a soft, plush fabric against the skin. It is non-irritating and perfect for those with sensitive skin. The wrap-around design makes application easy for swollen or injured knees. Features flexible medial/lateral spiral stays to provide side-to-side stability to the knee joint. 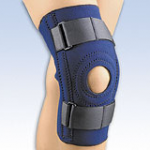 Condyle pads offer additional padding and stabilization to the patella. An open popliteal at the back of the knee eliminates bunching and irritation behind the knee. Two adjustable support straps give an improved fit that stays in place. Color: Beige.